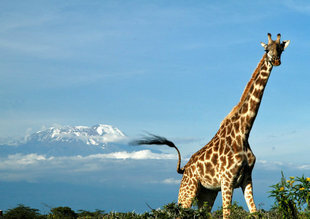 In the West of Arusha National Park Mount Meru is the second highest peak in Tanzania at 4,566m. 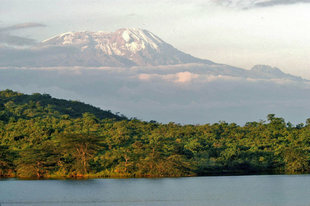 Until 250,000 years ago this volcano was taller than Kilimanjaro. Around this time a huge volcanic explosion vaporized the entire summit and eastern wall of the mountain leaving a vast 3 km crater surrounded by near vertical cliffs on 3 sides. A new volcanic ash cone has since formed in the base of the crater. Although technically 'dormant' the last eruption was only a century ago, and earth tremors are sometimes recorded. It seems like this volcano is only 'sleeping'. The spectacular climb up Mount Meru from Momela offers the opportunity of observing a wide variety of wildlife and excellent bird watching. 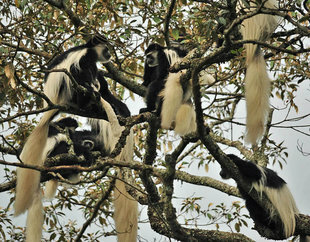 A Meru hike takes you from savannah and glades well known for their giraffe, waterbuck and buffalo populations, through dense rainforest, habitat of elephants, Colobus monkeys and eagles. Next are the otherworldly alpine moorlands, full of giant heathers and lobelias, adapted to extreme daytime heat and night time cold. The highest altitude level is a freezing high altitude desert - habitat of the huge Lammageier, a mountain vulture that often drops bones to crack them open and expose the protein rich marrow. From the lush tropics to freezing desert and back in 3-4 days. A remarkable journey in an undiscovered gem.